The Stackable Bunk Bed, ideal not only for saving space but can easily be taken apart and used as two twin beds later on! Add the Storage Stairs for a completely distinctively look while adding a safe access to the top bunk and creating much storage space. 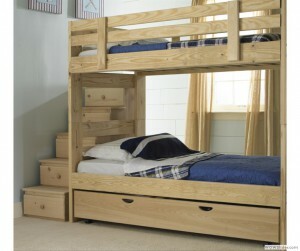 Or add a Trundle Bed for extra sleeping space.